Nandina is a natural blend of certified organic cotton and plantation grown bamboo. The fiber is woven into our Heavenly Cotton Bamboo towels, creating the luster of silk, the softness of aged cotton, and the durability and ease of care found in more traditional fabrics. Truly the "next generation" towels. We are proud that these towels have been certified free of harmful substances, often exceeding the highest standards set by Oeko-Tex, the world leader in textile testing for human ecology. With Nandina towels you don’t have to give up luxury to help protect the future of our planet. It’s easy to go green! The Nandina futurefiber is more absorbent and faster drying than ordinary cotton towels. Nandina fiber is created through a unique process of spinning bamboo and organic cotton together to produce a bath towel that is inherently hypoallergenic, anti-microbial, resists mold and mildew and won’t smell after it becomes wet. Even though Nandina™ fabric looks like silk and feels like cashmere, it is naturally strong and durable, so your towels will stand the test of time-wash after wash. 600gsm. 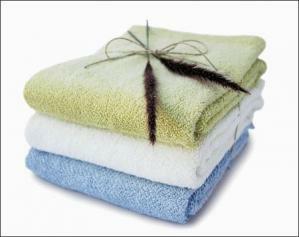 Sizes: Wash Cloth 12"x12", Hand Towel 17"x30", Bath Towel 28"x54", Bath Sheet 40"x72".